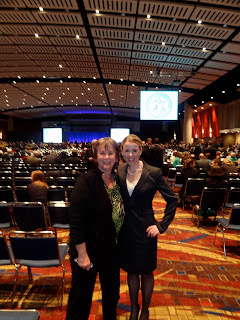 I'm now officially an attorney, licensed to practice law in Illinois. Woo hoo! It was SO SO great to spend some good quality time with my mom - it had been 6 months since we had seen each other - if that gives you any idea of how crazy busy my life has been lately! After celebrating with my favorite veggie burger @ Houlihan's for lunch and an always fun trip to Costco (as if that all wasn't exciting enough! ), we had a very important appointment to get to. We started off our shopping at a small bridal boutique in Park Ridge, Reddington Bridal. 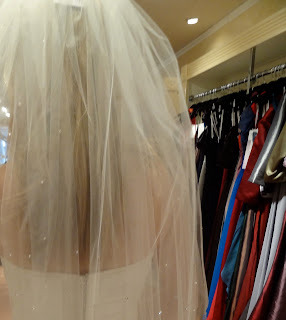 I have driven by Reddington Bridal tons of times, but actually decided to schedule an appointment because I saw that they carried a line I was somewhat interested in, Casablanca Bridal. I am so glad I decided to take a look at this little store, because it was a perfect experience from the moment my Mom & I walked into the door. We were greeted with a warm, friendly smile by the woman who would be helping us look at dresses, Suzanne. I liked how at Reddington, the dresses were out on the floor, so it was no problem if my mom wanted to browse around and pick up a couple of dresses for me to try on. I think I must have put on about 10 dresses, and all but 1 were selected by Suzanne based off of what my mom and I were liking and not liking. That was the great thing about Suzanne - she listened. With that listening, she was able to pull a dress I probably never would have tried, that really took both my mom and me by surprise. I looked at myself in the mirror, leaned my head back and forth looking at myself, then looked at my mom who said "hmm...that's kind of nice." Suzanne could tell that this dress might be a special one, so she pulled a veil to try, and that really knocked it out of the park. My mom and I both got pretty choked up, which I thought was a good sign. 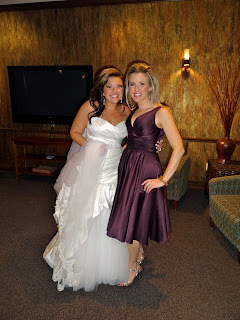 We ended up walking away from the dress that night because we had 2 more appointments the next day and wanted to see as much as we could before deciding. The nice thing was that Suzanne assured us when we left that she would open the store on Sunday for us to come back if need be, but we felt no "pressure." The next morning we head to a larger store about 40 minutes away that I was pretty excited about. I had high hopes for this store, because it carried a lot of the lines I had been looking at. I was really disappointed with this second store. I pretty much wanted to leave from the moment I got in there. I felt like the service was very impersonal - I was trying on dresses surrounded by a bunch of other brides and their entourages, often not having a place to stand in the mirror to get a good look at the dresses. Also, I really didn't mesh with the woman helping me try on dresses. She was nice, but she seemed very distracted and disinterested the entire time. I thought this dress was really pretty with all of the crystals and very flattering, but in the end it felt a little more pageant than bridal - it was all made out of tulle and I could tell even with alterations it would be difficult to get the bust area fitted enough to where I would feel comfortable for the big day. After spending some time in that dress, the sales woman ended up putting me in the same dress I loved at Reddington. Trying it back on solidified how much I loved the dress - my face lit up and I didn't want to take it off. However, even though the dress somewhat cheaper at this second store, I knew I would not be purchasing it there because of the poor service and cold atmosphere. We left empty-handed and went to the third and final store, Veiled in Elegance in Geneva, IL. I am a HUGE fan of this adorable bridal boutique. It is where my friend and bridesmaid, Christina, got her gorgeous wedding dress. Beautiful Bride Christina on her wedding day - 10/29/2011. The owner of Veiled in Elegance, Kathy, is also a dream to work with. There were a lot of contenders seen at this third and final stop, but after seeing about 10 more dresses, I knew what I wanted to do. When we walked out of the store, my mom asked me what I thought, and I immediate said with a big goofy grin "I want to go back and get that dress in Park Ridge!!" My mom was definitely a little shocked with how decided I was, but there was really no question. 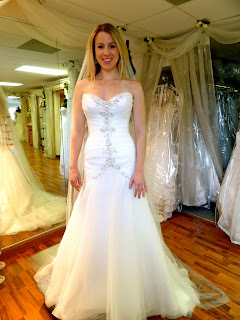 So we headed excitedly back to Park Ridge to see Suzanne - and put in the order for my dream dress. Sadly I cannot share the winner with you all today, because my hubby-to-be does faithfully read my blog. 1) The early bird gets the worm! :) I didn't want to go dress shopping too early because I was worried about styles changing and I also feel a bit of pressure, in general, not to rush things as far as wedding planning goes. I actually considered waiting until late in January to go shopping, but I am glad I didn't. The dress I ordered will not come in until the end of April 2012, and I have been advised that it can take up to 4 months to alter the dress. That could take me up to the end of August 2012. With a mid-September wedding, the timing is actually perfect. So, my first piece of advice is: if you think it's too early to shop for your wedding dress, it's probably time to get moving. 2) Bigger isn't necessarily better... When it comes to the store you are shopping at for your wedding gown. I thought it was really special to be the only bride-to-be shopping in the store when I was trying on dresses. It is more personal and less overwhelming. While smaller stores might have less in the way of selection - it can be a quality over quantity situation. My advice: Unless you are hoping for that "Kleinfelds" experience, narrow down the designers you like (based on price and style) and then find smaller stores that carry one or more of these designers, rather than going to one that carries them all. 3) Curb your entourage. Have you ever heard the saying about there being too many cooks in the kitchen? Well, I really think that applies to dress shopping. Unless you are someone who thrives off of a crowd, I would say take as few people as possible with you dress shopping. It's hard enough figuring out what you like on your own, let alone trying to please your best friend, aunt, grandma, mother, future mother in law, etc. Remember: you can always send out pictures of the winning dress to your close girlfriends and family members - they love you, they'll understand. 4) Come prepared. Bring a strapless bra, underwear typical of what you will be wearing under the dress, and any shoes or accessories you already have planned for the big day. This will help give you a good picture of how the dress will look and how it will fit into your overall vision. 5) Keep an open, but focused, mind. I knew I wanted a dress with either a strapless or sweetheart neckline, and that I didn't want a ball gown, but other than that, I was pretty open. I think it's good to go in with a somewhat focused idea of what you want so you aren't completely overwhelmed, but try to be open and flexible on some aspects. Like I said, I never would have picked up the dress I ended up purchasing, so I'm glad I gave Suzanne some wiggle room. 6) Remember - YOU are wearing the dress. As much as I knew I wanted to please my mom with the dress, I did constantly remind myself that I was going to be the one wearing the dress. There was one dress that I originally loved that my mom actually hated. Thankfully, I ended up liking the dress I went with better, and my mom just happened to love it too. I know if I settled for something just to please my mom, there was a good chance I would end up with second thoughts for the next 10 months. If know ahead of time that your style is going to be completely different that what your mom, or whomever else you are trying to please, envisioned you in - talk it out before you go shopping so that there is some sort of an understanding before you are on the spot. 7) Don't break the bank. I will be the first one to admit that I have always had expensive taste. I have always dreamed of wearing a Monique Lhuillier dress on my wedding day. Thankfully, I have had a just a few friends get married over the past couple of years, so I knew it was possible to get a gorgeous, well made dress at a fraction of the Monique Lhuillier price. I also knew that the second I stepped into a $6000 + dress, it would all be over. So, what did I do? I chose to shop at stores that didn't carry dresses priced much higher than my budget, and made sure to tell the saleswomen not to bring me anything over my budget to try on. 8) Put on your bargaining shoes. Don't hesitate to ask if there is any room for negotiation on the price of your bridal ensemble. That means - the dress, the accessories (bedazzled belts, hair accessories, etc. ), and the veil. Unfortunately, the designer of my dress does not allow its vendors to discount the price of the dress, so I was able to negotiate some discounts elsewhere. Also keep in mind the cost of alterations when you are crunching the numbers...I was quoted at between $350 to $500 pretty consistently for alterations. Remember, a penny saved is a penny earned for those Jimmy Choos! 9) Take pictures, then hide them. When you have found THE dress, spend some time in it at the store. Have the saleswoman (or man) "jack you up" as they say on that famous TLC show. Put on a veil, try on a hair accessory, and walk around in some heels. This may be the last time you see the dress, and yourself in it, for a very long time. If the store allows it (some don't), take some pictures of yourself in the dress so you can look back and daydream :) then hide them so you don't spoil the surprise for the big day. 10) Once you've found it, STOP looking. This one may be hard for me, but I'm committed to doing it. The last thing you need is second thoughts over one of the most important purchases you will ever make. Don't go looking at your favorite designer's next season's lines. That is a recipe for disaster. After you have swiped the plastic (or put the pen to the paper), cut the browsing off. Something to talk about: Any of you other brides-to-be or married ladies have some advice to add?? OMG! Im so excited for you! Yay for finding your dress love!!! 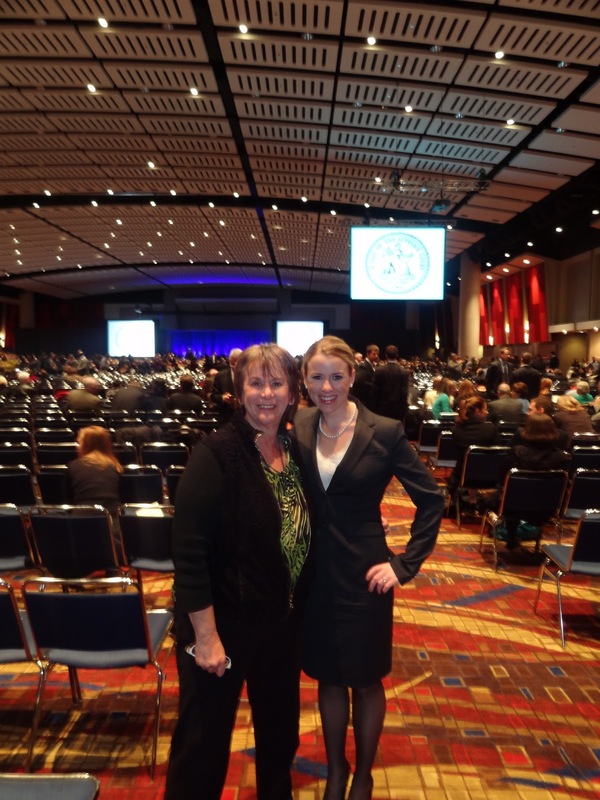 Congrats on officially being a attorney! Woot Woot! I hope you celebrated this weekend! You are going to be the most BEAUTIFUL bride!!!!! Love you dress story! I just found your blog. I am getting married in July and am excited to continue to follow your planning as I plan myself!!! Yay! So glad you found the blog, Leah! Congrats on your engagement!!! :) Such a fun time!